Yolanda Cooper will assume her new role as University Librarian on Jan. 15. 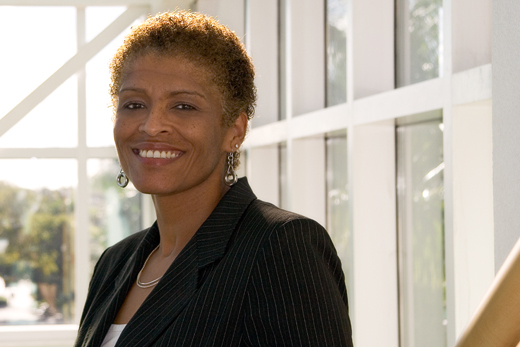 Yolanda Cooper has been appointed as Emory University Librarian, a recently redefined position. Cooper will join Emory from the University of Miami, where she has most recently served as librarian associate professor, deputy university librarian, and acting dean and university librarian. On Jan. 15, Cooper will step into the new role leading the Emory Libraries — part of a broad, overall organizational restructuring implemented under the leadership of Rich Mendola, enterprise chief information officer and senior vice provost of library services and digital scholarship, that has combined Emory's library and informational technology organizations and reflects the increasingly important relationship between digital technologies and research libraries. Cooper will oversee many facets of the Robert W. Woodruff Library and its affiliate branches, including areas of content, services, scholarly communications, external affairs and library administration, as well as the Manuscript, Archives and Rare Books Library (MARBL). Directors of the Goizueta Business Library and the Woodruff Health Sciences Center Library will also report to Cooper. Her new responsibilities will include: articulating ways in which library services, digital scholarship and informational technology can better support Emory's mission and vision; implementing annual operational plans for the Woodruff Library and its branches; chairing the Library Cabinet; and working with key library governance groups. Cooper's selection was the result of a national search, headed by Michael Elliott, senior associate dean for faculty in Emory College. "The search committee and library HR staff did an outstanding job identifying qualified candidates," Mendola says. "Yolanda's experience, leadership qualities and enthusiasm for our new direction made her a standout in that field. I am very excited that she will be joining Emory and my leadership team." Cooper has 25 years of administrative experience in university libraries across five research library systems. At the University of Miami, Cooper has been responsible for services, programming and operations of all libraries on the Coral Gables and Virginia Key campuses. Her background also includes work with research library systems at Indiana University Bloomington, the University of Virginia, the University of Northern Colorado, and the University of Illinois, Urbana. Cooper's professional library experience has touched upon many operational areas in both public and private institutions, including technical services, digital programs, access services, special collections and administrative services. With Cooper's appointment, "I think we have found the ideal candidate to lead the Emory libraries," Mendola says. "Yolanda has accumulated a wealth of operational experience at several leading university libraries, has led multiple strategic planning and accreditation efforts, and is well positioned to take on this important role." Mendola notes that Cooper's enthusiasm about the new organizational structure, "along with the capabilities she will bring as a member of the Library and IT Services leadership team, bode very well for our future success."